Ballymacnab recorded the largest margin of victory of all the SFC round 2 games at the weekend with a 15-point win over arch rivals Granemore. 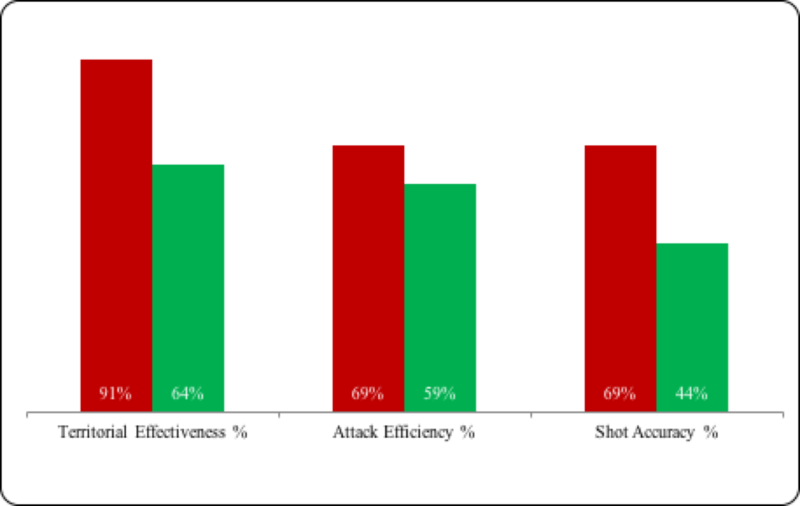 Ballymacnab’s accuracy in front of goal drove them to an impressive victory converting 69% of 29 shots. Returning a score of 2-18 from 42 attacks. It was Granemore who got off to the best start when Tony McClelland drove through the ‘Nab defence to set up Pete Carr for the first score of the game. The score was soon level though, when Ballymacnab’s Ryan Kennedy surged forward from centre half back to split the posts. 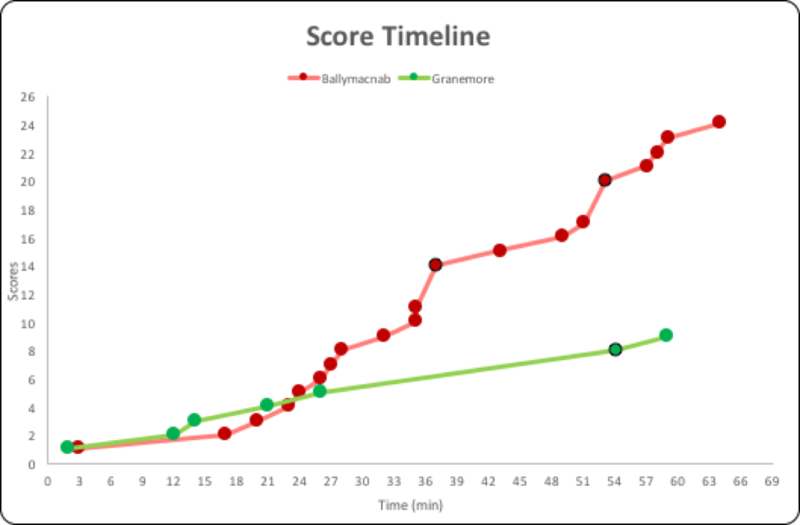 Granemore’s defence was on top early on as they turned over 4 of Ballymacnab’s first 5 attacks. However, were only able to convert 1 of their first 3 shots. Their fourth shot did put them in front, when Jason O’Neill pointed from a free while Liam Doyle also got on the score sheet to further his teams advantage to 2 points. 2 of Granemore’s 3 points initiated from turnovers. Ballymacnab’s Captain Brian McCone put his side within a point of the leaders before Rory Grugan linked up with his brother Jack to level the game. Granemore dominated their own kick outs, retaining 100% in the first 20 minutes, with Kieran Doyle collecting a break ball to provide an attack which resulted in Kieran Toner pushing his side one point ahead. Gavin McParland’s run through the Granemore defence led to a free which Rory Grugan converted before McCone again struck from the dead ball to leave the score 0-5 to 0-4. 3 of Ballymacnab’s 5 scores originated from turnovers. Granemore scored their final point of the half on the 25th minute, another Jason O’Neill free before Jack Grugan scored his first. Two Finnen Maguire points left three between the sides before a brilliant individual point from Rory Grugan, who turned the ball over prior to attacking, left the score 0-9 to 0-5 at the break. Ballymacnab controlled their own kick outs, winning 7/9 and converted 3 of the retained restarts into scores. From 19 attacks, Ballymacnab attempted 12 shots converting 75%. 4 of their scores came from turnovers. Granemore made 11 turnovers in the first half, 5 of them coming in midfield. They created 15 attacks and 10 shots. However, they only managed to convert 50% of their shots into scores; kicking 4 wides and dropped 1 shot short. Granemore won 45% of all kickouts in the first half, winning 7/11 of their own but this only produced 1 of their 5 points. Ballymacnab stepped their performance up another gear in the 2nd 30 minutes. Scoring 2-4 before they eventually conceded in the 22nd minute of the second half. The Grugan brothers both scored a point each before Rory struck for a goal after good work from Ryan Kennedy who won the break ball in the middle of the field. This meant that the Nab had now converted 71% of their shots. Paul Kennedy then scored his first before another Rory Grugan free was placed over the bar. Jack Grugan then got his 3rd point when Michael Beagan intercepted a Granemore attack, meaning 1-7 of Ballymacnab’s 1-14 was created from turnovers. Ballymacnab’s dominance was reflective in the kickouts, winning 7 out of 13 Granemore restarts at this point. Ballymacnab stretched their lead to 15 points when Gavin McParland was fouled leading to Ryan Kennedy striking the ball to the back of Granemore’s net from the penalty spot. 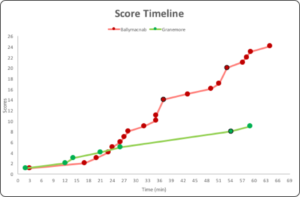 Granemore’s opening score of the half then followed when Eoghan O’Neill got his team’s only three-pointer. The next two scores belonged to Ballymacnab with points coming from Pauric Gribben and Damien McGeown, with 5 minutes remaining. Granemore’s solitary point of the half came from the boot of Jason O’Neill. Before Michael Beagan came forward to fist his side 14 points clear. Gavin McParland’s only point of the evening came just before the final whistle sounded; leaving the score board reading Ballymacnab 2-18 to Granemore’s 1-6. This was Ballymacnab’s 29th shot of the game, of which, 69% were converted to scores. Only kicking 6 wides in the entire game. They also had 27 turnovers (12 in defence) which led to 13 of their scores. They retained 75% of their 12 kickouts, bringing them 4 scores, while they also got 3 scores coming from Granemore kick outs. While Granemore won the majority of their own kick outs; 18/28. 15 of their 28 kickouts resulted in breaking ball in the middle of the field. Granemore winning just over half, as Ballymacnab winning 7 of the 15 break balls. 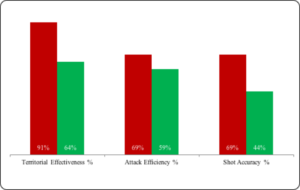 Granemore had 16 shots from 27 attacks, only scoring 1-6, giving them a 44% shot accuracy. Granemore: Kevin Kelly, Rory Conroy, Darren Carr, Darren Hughes, Kieran Doyle, Tony McClelland, Ross Finn, Kieran Toner (0-1), Pete Carr (0-1), Shane Rafferty, Brendan Boylan, Liam Doyle (0-1), Jason O’Neill (0-3), Declan Doyle, Eoghan O’Neill (1-0). Subs: Jim Shortt for P. Carr. Ciaran Boyd for D. Carr, Marty Carr for D. Doyle.